HOW WILL MAN-AS-HE-IS INTERACT WITH MAN-AS-SHE-MIGHT-BE? John Ashley and his student lover, Liz Brown, break more than academic taboos when they meet two attractive strangers. But these strangers are stranger than John and Liz imagined: they are from the planet Kozlar and they have integrated brains. Homo Integrens is an evolutionary step or two ahead of Homo sapiens: they can outcon us any time. With a little sexual blackmail, John and Liz are persuaded to visit Kozlar where they learn they are to be subjects in surgical experiments on their brains. If the experiments are successsful they will be held as breeders, but if not? Don’t ask. Their only hope is the loving, child-like Weyen. But hey, hasn’t she got integrated brains too? Genre Fiction, 2003 Jacobyte Fiction Competition. The characters strong and likable, … plot suspenseful … denoument dramatic … a very fitting end. 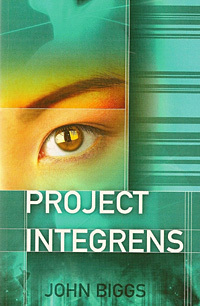 While ardent Sci Fi fans might find Project Integrens a bit light on the Sci, and heavy on the Fi, for those of us who aren’t very familiar with the genre, Project Integrens is entertaining, well-paced, and rewarding. Biggs integrates elements from several genres – science fiction, romance, satire and occasional soft-core erotica – to create an exciting story of adventure, space travel, humanity and the quest for the truth. Even more attractive is the clarity of the story. Each scene’s dramatic colour and movement … seems to demand a screenplay version … Project Integrens will have immense appeal to all readers of speculative fiction.